Oddly, I seem to be on a Mediterranean kick this week, even though the theme of this post is variety… especially regarding salads. I’m the only one in our family of 3 eating this way, and I just can’t get to the grocery more than once per week. This leaves me combining some of the same things in different ways in order to not be tossing out piles of rotten veggies, yet I don’t get bored if I vary it enough. 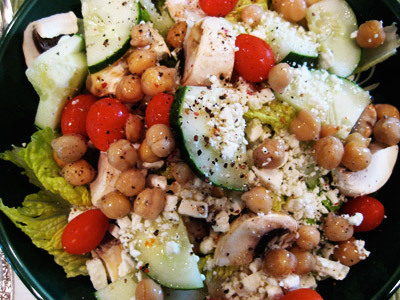 Today’s lunch salad seems easy enough right? But the secret to making this especially flavorful and not just your lettuce/tomato kinda thing is the addition of two ingredients. First, feta cheese, allowed on Phase one, and so tangy and yummy. Keep a variety of cheeses on hand, always buying low fat if available. Second, chick peas, canned variety, which will last pretty long in their packing juice in your fridge. 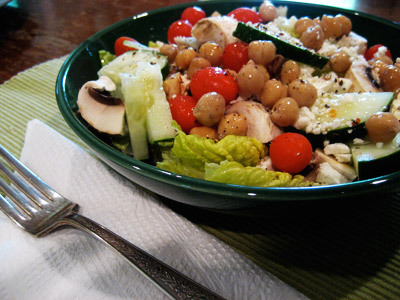 Chick peas add a different texture AND, very importantly, another boost of protein. Of course there are endless varieties with this… add some sliced black olives (sorry, I hate them) or some sliced veggie pepperoni (YUM!). Try arugula (you can buy it washed and bagged now) or fresh spinach. Anything goes, just try to consider complimentary ingredients and remember that variety is really key. Mix it up to dazzle your tastebuds. I like to keep several bottles of tasty low-fat olive oil-based dressings on hand for variety’s sake too. Don’t forget the fresh ground pepper! Bon appetite!